Omg, that bat is horrifying!! You really snapped a great pic. 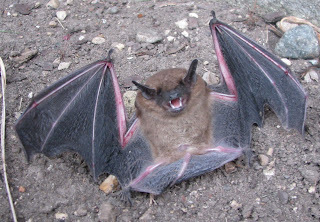 I've never EVER seen a bat around here my whole life and I live right by you! Good for you! I once found a bat flying around the light in our bedroom. I shut the door and had to call a friend to come get rid of it. I was too freaked out to even try! That's a great picture of the bat, but my goodness does he look nasty! That is the friekiest thing ever! How terribly scary! I hope I never see a bat - much less one in my house. You brave soul!